In August 2014, the Kickstarter for Chris Handy’s “Pack O’ Game” burst onto the scene, a project for tiny yet intriguing card games. 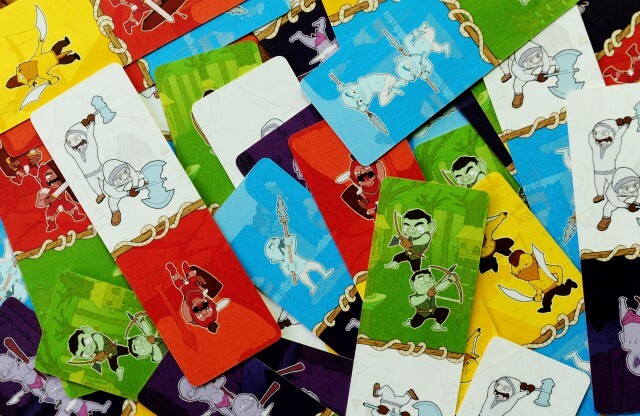 Successful in funding, the campaign ended up hitting enough stretch goals for the pack to contain 8 games in gum-sized boxes: HUE, TKO, GEM, FLY, TAJ, LIE, SHH, BUS. 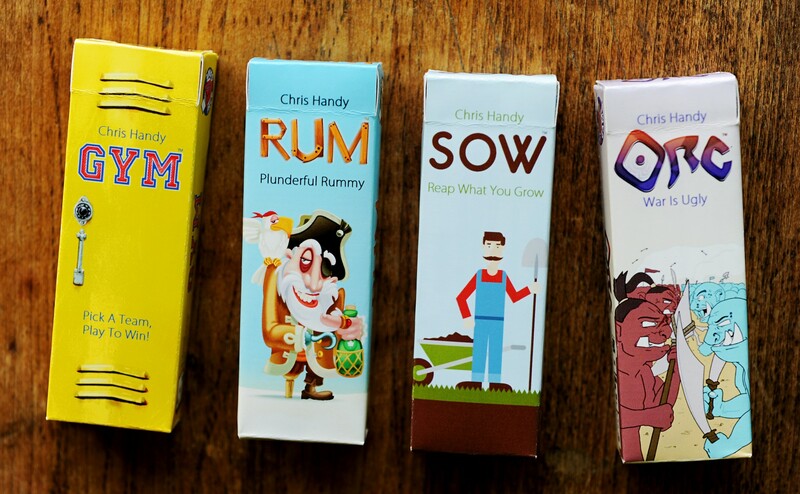 Innovative and fun, we love that 8 pack of games; we’re excited to preview the 4 initial games in Chris Handy’s Pack O’ Game 2 Kickstarter, launching tomorrow on 3/3! Check out what Nicole and Sean think. SOW – This game about planting seeds and picking flowers is a little bit mancala, and a little bit hidden goal. An interesting mix! 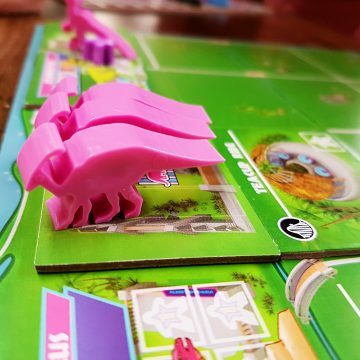 For 2-4 players, SOW sets up its play space in a little windmill-style shape, with each player having a wheelbarrow and garden space in front of them. Before the game starts, you take a look at the ‘favourite colour’ (aka favorite color for you folks south of the border) on the back of your wheelbarrow. You’ll be aiming to pluck flowers that have your favourite colour in the middle or the petal portion – these will be worth extra points for you at the end of the game. And then begins the tricky little mancala dance of shuffling seeds around all of the player’s gardens – on your turn, you’ll take a whole row of soil and move/lay them out in the direction the windmill indicates currently. Choose wisely, as the last card you place will transform! Seed cards flip to flowers, flowers are harvested, the windmill is flipped, or the gopher may either remove flowers from the game, or to your personal bouquet. We’ve played this with three players, and it does leave things a little imbalanced – the garden on the fourth side of the setup tends to mess with plans a little where it might not if there were a full complement of players, or perhaps just 2 players – so give this one a try with even numbers. See how well you can manipulate the flow of seeds and flowers to make the most of your favoured colour, and even just to have the biggest bouquet at the end of the game! ORC– is one of those games so simple, but with a hidden depth that can’t help but make you smile as it dawns on you how tricky it can be. It really forces you to outthink your opponent. There are six different races (or colours) of orcs. All of the 30 cards have one orc on one half and two orcs of another colour on the other. At the start of the game three cards will form a battle line with each colour being represented. Stockpiles of four cards are placed down on either side of the battle line cards making six different stockpiles. Finally there will be three cards left over. One player will choose to either take one of the cards and go first or take two cards and go second. Each turn, players will deploy orcs from their hand to their side of the battle line. They’ll assign a card to one of the different orc races in the line with some very specific rules. You can’t deploy the same colour of orcs as the one in the line that you’re fighting for and, if your opponent has placed any orcs there you can’t deploy the same colour as them. Once you’ve assigned a race of orcs to fight that specific battle you can only add orcs of the same race to that fight (I mean come on! Orcs of different races are not going to join forces). Once you’ve deployed it’s time to take reinforcements. If you sent two orcs to battle you can take one card from any stockpile. If you sent only one out you can take two cards. Taking stockpile cards not only gives you orcs to play on future turns. It also is a timer for the battles. As soon as all the stockpile cards are exhausted beside one side of the battle line that battle is assessed. Whoever has put more forces into the battle conquers that colour. The game ends when all of the stockpiles are empty. You get a point for every orc you control in the battle line as well as any of the same colour that you control in your hand. Now if this sounds a bit like Reiner Knizia’s Battle Line, it is, but that’s not a bad game to be compared to. ORC is interesting because it allows to control the tempo of the different skirmishes you’re engaged in and also because…you know it fits in a gum sized box. Fun little game. GYM – Ever feel like you’re missing out on that high school experience of being the one who gets to pick the sports team (instead of being the one picked last, am I right?)? While this game can play in teams of 2, we just played it straight up 2 players, 1 vs 1! Through two rounds of team selection, you’re aiming to pick kids for your team that will excel at certain activities (weights, table tennis, tug o’ war, dodge ball, gridiron, and basketball). As you’re selecting for your teams, you’ll have to take on a bully (or two.. or three!) – while not great for the actual sporting events, these kids will allow you to bump up the sporting activities you want your team to take part in when you’re in the phase of assigning kids to teams. 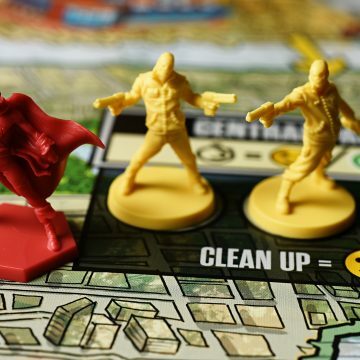 This is where the simple strategy of picking your team members turns into a little bit of chaos. Four of the sporting events are now out to assign your teams to – but it’s not that simple! For every kid you assign, an action may be taken. For instance, table tennis can let you switch two of the kids on one side (this can be pretty handy if you wanna mess with your opponent!). Or, when placing on the gridiron activity card, you can then randomly pick a kid from your opponent’s hand and force them to play that on their turn. And so it goes, as you each play out your 12 kids. In addition to playing regular kids to the sporting activities, you’ll be able to play out the bully kids. This will let you assign one of the two coaches (these are the flipside of the two activities that didn’t make into the latter half of the game). Coaches are assigned to look out over one of the sporting activities your kids are assigned to – this means they can’t be messed with! This can be quite valuable to ensure you’ll (hopefully) end up winning the activity you’re strongest at. Once all of the kids/coaches are assigned, you’ll tally up the strength of those kids that have skills for the activity they’re at – that can be a value of 1 through 4. If you have the strongest team, your points are tallied by taking your score and subtracting your opponent’s score (e.g. You’ve got a skill of 5, your opponent 2 – your points for this activity are 3). Whoever has the most points after tallying on all 4 activities wins. With a little strategy during the team selection phase, and some luck in the chaos of the team allocation phase, you’ll come out on top! I found this to be an intriguing 2 player experience, and I think you could definitely hone in on some tactics to come out on top with repeated plays. RUM– A pirate’s life often contains little more than the search for a stiff drink. In RUM a ship carrying precious cargo has sunk, but with a little luck that cargo might wash ashore. Players will be collecting sets of bottles and cashing them in for points. 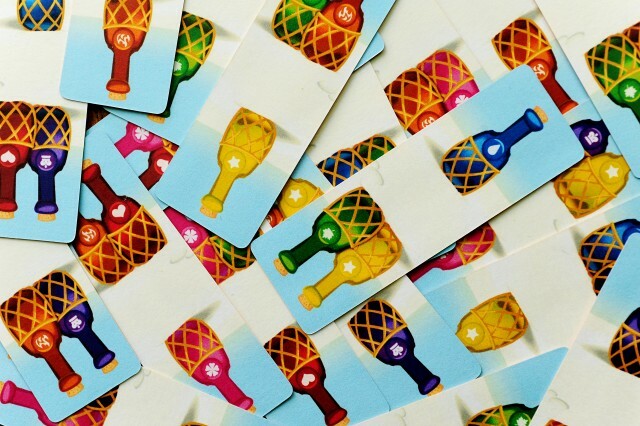 Most of the 30 cards included in RUM have one coloured bottle on one side and two on the other. Three bottle cards form the beach, kind of a face up pool for everyone to use or draw from. The rest of the bottle cards create the facedown shipwreck. There are seven different colours of rum bottles and a Captain card for each colour. The Captain cards are an ingenious little way to keep track of points. Finally there is the Castaway Clock. This is the timer for the game. The Parrot card is hidden somewhere in the shipwreck and every time it gets drawn the Castaway Clock advances. On a turn players will either draw cards into their hand or play out a set of bottles that can nab them at least one Captain card. When drawing, players can either take from the face-up beach or test their luck pulling randomly from the shipwreck. If they’re unlucky and come up with the Parrot card, they must discard two or three cards (depending how late in the game it is) and the Clock marches forward. The Captain cards are gained when you cash in a set that contains at least one bottle of their colour. They are placed in front of you with the ‘1’ value at the top. That is now worth one point. Other players can steal it from you, but they must cash in a set worth two or more. As the Captain cards are stolen they increase in value, by rotating them so the next number is face up. If you’re able to collect all three of the single bottles in a colour and use them to claim a Captain card you can increase the value by two. The game continues until the clock runs out or someone achieves the necessary points to win. 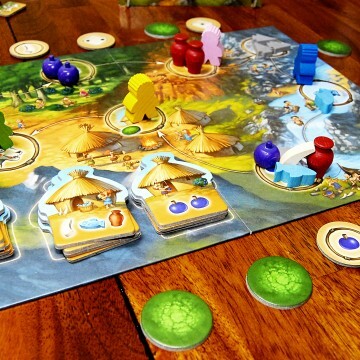 RUM is a fun, simple set collection game that does interesting things with the limitation of 30 cards. Not my favourite of the bunch, but definitely worth a shot!